My friend Susan has been extremely dear and important to me since high school. She left the midwest for beautiful Portland, Oregon several years ago so I don't see her nearly often enough. 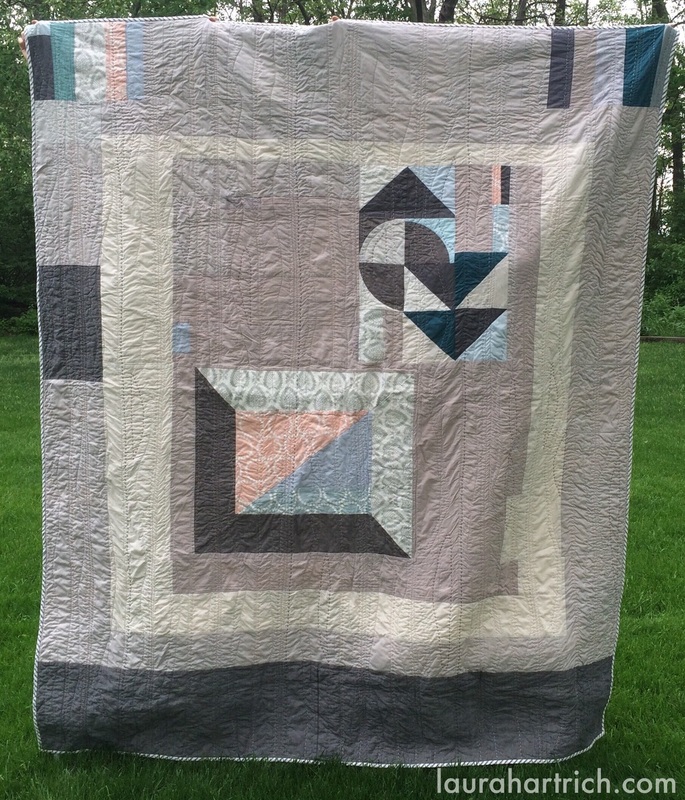 She has always had impeccable taste, so when she got married, I wanted to give myself the challenge of making a quilt she could love and that would look great in her gorgeous Portland bungalow. Susan had expressed admiration for the work of the Hopewell Studios. I took direct inspiration from their quilts, but tried to put myself in there too. I had a few goals for the making of this quilt. I wanted to shop strictly from my stash. I started out strong in this regard, but ended up buying some additional neutral solids. I also wanted to work ruler-free for this quilt. I almost accomplished that, but did need to do a bit of measuring to successfully piece the mitered corners. And I threw in a few orphan blocks that were originally constructed using rulers. Everything else was improv with no rulers! Working out the composition on the design wall. I began quilting this on my domestic Juki, with a mix of straight lines and curved lines. I wasn't thrilled with how the quilting looked, and I didn't enjoy shoving this big quilt through my machine. I decided to add some big hand quilting. I always love the look of big-stitch hand quilting, and sometimes use it to (hopefully) compensate for the shortcomings of my machine quilting skills. As always, I would change a few things if I could, but overall I'm happy with how this quilt turned out. I know it's already getting a lot of good use in Portland. Susan said it was the perfect weight for summer, which makes me happy.